Often technology keynote addresses attempt to inspire, but very few leave the audience ready to run onto the field and tackle their competition. 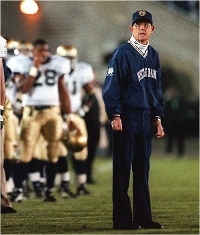 Leave it to legendary Notre Dame football coach Lou Holtz to get a room full of channel partners into a huddle and charge them up for game day. Holtz inspired attendees of the Fall ’09 VTN Invitational in Denver during his keynote address this morning, which focused on leadership and the values that make relationships and organizations excel. Major points included having the right attitude, having a passion to win, focusing on your purpose, having a dream, and forging good relationships. Holtz also relayed several anecdotes about how he inspired success for the Notre Dame football team and how he had accomplished the majority of things he set out to experience in his life, including jumping out of an airplane. “Don’t go through life and be a spectator,” Holtz said. Do right (and avoid doing what’s wrong). If you do right, people are going to trust you. Do everything to the best of your ability. Don’t lower your standards. This will let people (your customers) know that you are committed to excellence. Holtz pointed out that the marks of a person you admire and respect will always be that you trust them, you know they are committed to excellence, and you know that they care about you. Anyone you have a problem with will fail at least one of those three requirements.